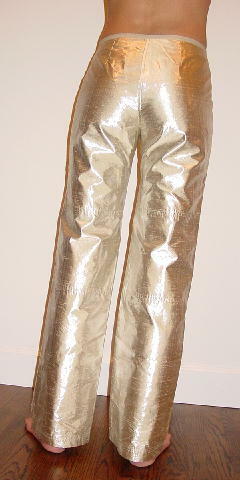 These champagne-beige silvery lame Strenesse pants are 70% silk and 30% metal. They have a 5" long front zipper and an orange oval logo on the upper left front side with the letters G S J inside. 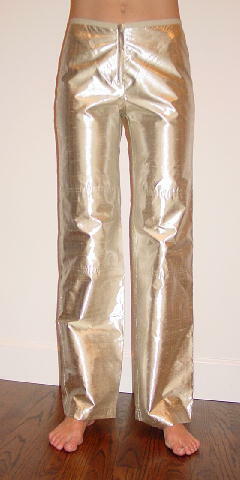 There is a champagne-beige lining which is attached to the waistband and floats freely down the pants and ends at the lower of the two horizontal leg seams. There is a 1/2" wide flat cord waistband. They're from a French model, who said she wore them only once.